The auto industry model year (MY) runs from August 1 to 31 July, so a 1990 model could have been produced between 1 August 1989 and 31 July 1990. 1989 MY: 87% new Type 964 Carrera 4 (all wheel drive) Coupé launched January 1989 with new 250bhp, 3.6-litre, air cooled, flat-6 engine with 6-speed manual gearbox. Features include new look body, coil spring suspension, power steering and ABS. 1990 MY: Carrera 2 launched in Coupé, Targa and Cabriolet bodystyles. From January, optional Tiptronic 4-speed auto on C2 only. 1991 MY: 3.3-litre, single turbo, 320bhp, 964 bodied Turbo available November, RHD from March. 1993 MY: In October, Turbo engine increased to 3.6-litre with 360bhp. Special edition Turbo S with 381bhp (and RS spec bodyshell and Speedline alloys). In February, 911 Speedster with raked windscreen, plus lightweight roof and interior. From March, 911 Celebration (30 years) model C4 with Turbo wide body (but not brakes and suspension), special paint and full leather. RHD only Targa 'Florio' special edition with full leather. 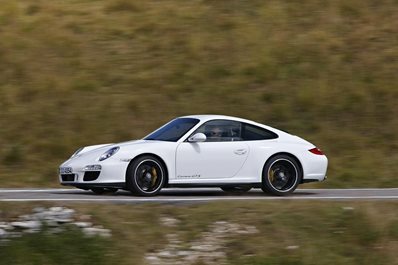 300bhp Carrera RS 3.8 with Turbo body, bi-plane rear spoiler and Speedlines. 1994 MY: Coupé and Targa C2/4 production stops in August. Turbo, Speedster, Cabriolet and C4 Turbo look stops January. The 964 could be described as the 911 with attitude. It does have fairly plain looks, but the sound its flat-6 makes is arguably the nicest of any of the modern air-cooled cars. There is a pent up aggressiveness in its growl and at the time, it was the most powerful normally aspirated 911 ever built. Nevertheless, despite this somewhat raunchy first impression, it did represent a major redesign of the philosophy and for the first time included features such as coil spring suspension, ABS and power assisted steering. These features all improved the 964's driving behaviour. The 964 consigned the earlier models to the 'classic' era. The new all-wheel drive system was a major development and despite its heaviness, gave the 911 a new sure footedness and turned it into an excellent tourer. The slightly later Carrera 2 retained the agility of earlier models and is perfect for the driver who wants a sportier drive. The Coupé is the enthusiast's choice for its bodyshell rigidity, but the Targa and Cabriolet offer open air advantages. The 964 model Turbo used an updated but proven version of the previous rear wheel drive, 3.3-litre 930 turbo. The 964 Turbo offers the kind of extreme driving experience that includes rapidly changing torque on hard acceleration and, by today's standards, enormous throttle lag. It's the complete fun package, but definitely one for the enthusiast. The 1993 Turbo S enjoyed 3.6-litres and its rawness has made it the ultimate (and collectible) single turbo Turbo. The Carrera RS is a very sought after collectible. Developed by the racers at Porsche's development centre, it was the blueprint for the hugely successful Carrera Cup race series. It's power is fluid but significant while its harsh ride is really only at home on super smooth surfaces. There was a punishing recession in the early 1990s that took Porsche to the brink. The engineers responded with some excellent specials in the darkest period - namely the Speedster and the 911 Celebration model. Both are unique and highly collectible - with values to suit. The 964 is a fairly easy car to drive compared to earlier models. Combined with the all wheel drive (Carrera 4) this is a great touring 911. For best touring (cabin quietness) and bodyshell rigidity, it has to be the Coupé. The Targa style had mixed reviews when the car was new, but the drop top facility maintains the cabin security if you need to park on street. The cabriolet is the full top down option that you will either love or not. The later cars ('91 onwards) are better built than the earlier cars, but check the Vehicle Identification Number (VIN), to confirm the model year. An '89 model has a 'K' at the 10th digit of the VIN, a '90 model a 'L', a '91 an 'M', a '92 has 'N' and '93 a 'P'. The '91 cars had better cylinder head sealing, for '92 there was a stronger flywheel and the '93 cars have improved interiors. Because of the early 1990s recession, quite a few 1991 models were sold through '92 and even '93, so this is an important detail. The majority of Carreras have manual gearboxes. The 4-speed Tiptronic is an easy 2 pedal driver, but the torque converter does take a slight edge off the performance. As noted above, the 964 offers some very attractive faster models. The 3.3 Turbo is a very complete (and powerful) package that is far more affordable than later Turbos. Unlike the Carrera RS, Speedster and 3.6 Turbo, values of the 3.3 models are somewhat more sensible, although they still represent a sound long term investment (as far as any classic car can be that is susceptible to market fluctuations). All require care in selection. The first thing to realise about owning a classic Porsche such as the 964 is that there will not only be an annual oil change cost, but higher than expected maintenance. This is a car that loves to be driven regularly and this is one of the secrets to keeping maintenance cost down. Even if the car's mileage is very low, it is essential to have the engine oil changed annually as storage can promote condensation inside the engine. On top of an annual service, which can cost from £250 to £400, there will be safety aspects beyond the VOSA test such as perishing tyres, corroding brake discs and pipes, brake fluid water content and battery condition. Tyres tend not to wear out on cherished cars that do little mileage, but perishing and ageing can occur. Consequently expect to be changing tyres (£750 + VAT) every 10 years or so and a similar interval for little used brakes (£1-1.2K +VAT). Clutches last a long time (perhaps 70-80K miles typically), while a replacement might cost £750-1K + VAT). Air conditioning on early 1990s 911s was fairly rare and today those systems will have needed complete rebuilds and re-gassing with eco-friendly refrigerant. If this hasn't been done, expect a cost approaching £1K + VAT. Chasing down 964 engine oil leaks was a regular activity in previous years and today, even if the engine has had a top end rebuild to fix these years ago, the cam covers can still leak. Fixing these can cost around £500 + VAT, but it’s likely other issues will be found when the mechanic is 'in there'. A well serviced 964 engine should run for at least 120K miles before the heads need attention. A surprising cost on 964s can be extensive bodyshell restoration. Some cars have rusted out around the rear suspension attachment points and this can cost high thousands to cut it all out, repair and repaint. Unsightly surface rust can be found on the front and rear panels around the screens, while stone chips can degrade the frontal area panels. '90 and '91 models had marginal dual mass flywheels (hear a clonking while accelerating). Replacement can cost £8-900 + VAT. The front lower control arm bushes wear out at between 70-100K miles. These can be rebushed, but replacement arms cost £375 +VAT each. Similarly shock absorbers are well past their best after 15 years and a replacement set might cost £1K + VAT. As mentioned above, a full check of the bodyshell is an essential part of 964 selection (particularly the early cars). A cheaply restored 964 will reveal itself with badly refitted seals behind the sill trims, poor panel gaps and notable trim creaking or rattling when driving. Earlier crash damage can reveal itself in the front compartment when the carpeting and emergency wheel is removed. Cosmetic corrosion as mentioned in the previous section, will be less expensive to fix, but can add up. The solid colours such as Guards Red and GP White tend to suffer from UV degradation and are difficult to match when partly repainted. Pale areas (exposing undercoat) can suggest over polishing and a car ready for a full repaint. A quality repaint will cost £5-6K + VAT. Cabriolet roofs or just the plastic windows can be replaced, usually for around £1500 + VAT (the quality option is the only option to choose), but the little clamping motors (to the screen top edge) can cost £150 to rebuild. Both the Cabrio and the Targa can suffer from water ingress, so lift the carpets to check for signs of dampness or crusty carpets. The Carrera RS has various bodyshell authenticity checks that are an essential pre-purchase requirement, so consult an expert beforehand. The 964 is just about the only 911 that gets away with acceptable customising and it is common to find early C2s and 4s with Turbo 'tear drop' mirrors and Cup style alloys. However, stiff aftermarket suspensions and further mods will reduce the desirability. It is fairly straightforward for the unscrupulous to adjust the mileage on these cars, so a solid service and VOSA history is always valuable. The Vehicle Identification Label (VIL) under the bonnet (with German headings to each line in bold), the paint code label in the front compartment nearside and the data labels (front compartment offside) help identification. The bodyshell VIN can be found on a tab under the fuel tank in the front compartment. The main issues for the M64 engine are broken cylinder head studs (often revealed with leaks or higher speed misfire) or excessive oil leakage (symptoms include an engine undertray wiped completely clean or a heavy oil residue). A head rebuild should cost around £5-6K + VAT. On the Turbo, look for repairs, turbo oil leaks and blue smoke on acceleration (worn turbo). As most 964s are not used regularly today, so check everything works, particularly the seat adjusters, heater fans, cabrio roof, windows and mirrors. The Tiptronic has been reliable, but a noisy torque converter can spell trouble. Always try to drive the car before you buy. These are high performance cars and the ride, handling and performance may not suit you for various reasons. If you don't have the experience to check the car out yourself, get a pre-purchase inspection expert to look at the car. They will advise on all aspects of the car's condition, what needs replacing now and in the short term and whether the car is valued correctly. Run by dedicated and friendly Porsche enthusiasts, we are here to help you get the most out of owning your Porsche. We have over 30 model-specific Registers, each run by enthusiastic volunteers and technical experts who will be happy to assist you with any questions you may have. 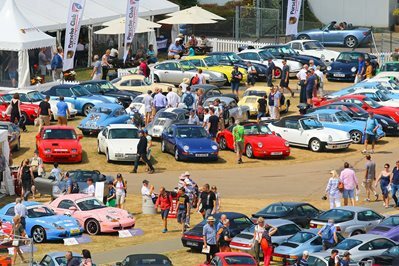 Click here to join Porsche Club GB.